Durban - As entries for the aQuellé Tour Durban presented by Bridge Fund Managers on 28 April start to pour into the race office, more and more mountain bikers are entering the 55km event that the trail designer is determined to make an easy and accessible option to less experienced MTB riders. With mountain bikes making up a significant percentage of the entries for the shorter 45km and 55km options, trail builder Ian Wilson is urging MTB riders to take on the 55km option, particularly if they are relative MTB novices. The event, which was added to the race in 2013, is dubbed a cyclocross race, but differs from the traditional cyclocross format as it consists of 40km of the popular out-and-back 45km Fun Ride up the M4 to Umdloti, with a 15km detour that takes in farm roads and some single track inland of the M4, passing under the N2 freeway twice. “Most of it is really easy riding on dual track roads through the sugar cane plantations,” says Wilson. “The idea is the make it as manageable and do-able for riders of all abilities. “It would be an excellent race for a beginner on a mountain bike who has never done a proper MTB race before. There is an easy hour to warm up on the M4 before branching off into the off-road section. He added that only a small section of the off-road sector was made up of single track, totalling less than two kilometres. “We are working hard to make this off-road section as rider-friendly as possible, clearing any thorns or stones that might cause punctures,” he added. “There are so many mountain bikes on the 45km race, and we would really encourage as many of them to enter the 55km race and enjoy this unique ride that offers the best of the road cycling on the M4 as well as the fun of the off-road segment through the picturesque sugar cane fields and natural bush of the Tongaat Hullett Estate between the Umhlanga River and Umdloti. The race often attracts elite mountain bikers, some of whom opt to ride road bikes in a cyclocross setup with special road tyres that easily handle the cane roads and single track. In 2015 Darren Lill won the 55km race on a full road bike in what he admitted was a risky gamble, but one that paid handsome dividends on the day. 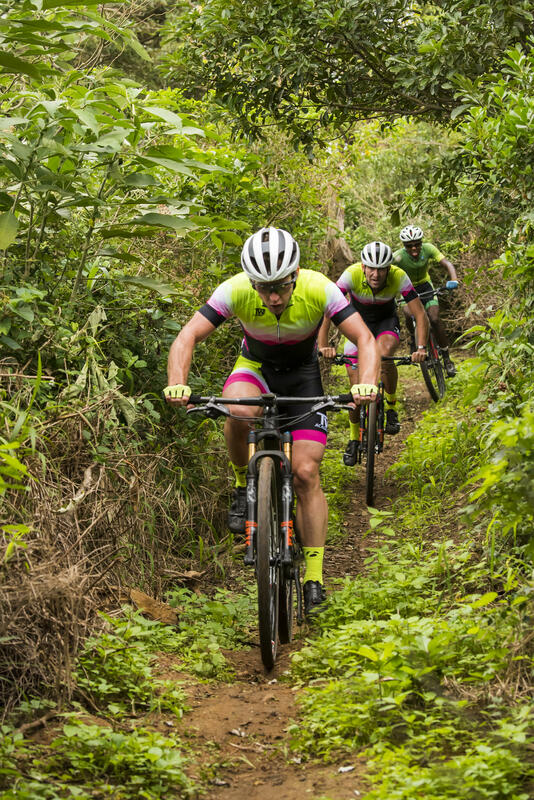 There are some beautiful trails help make up the 55km Cyclocross route, with riders enjoying the lush vegetation and manageable single-track before returning to the M4 as they head to the finish of the aQuellé Tour Durban on Sunday, 28 April.